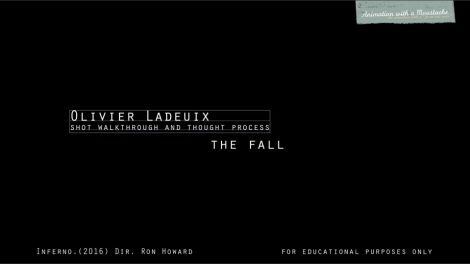 I never bothered making a showreel with my VFX work as I haven’t done anything really substantial during my time at Double Negative London but I worked out this could be educational for anyone wanting to join that industry. In the next few weeks I will be looking back at some of the VFX shots I animated on or contributed to and offer a glimpse at what really goes on at one of the top VFX studios like DNeg. 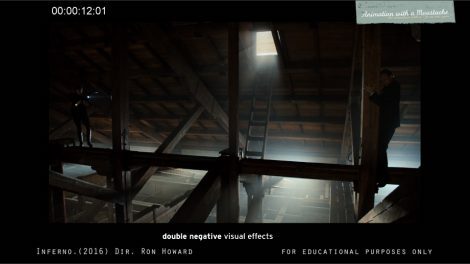 Today we are starting with my first shot on a VFX feature with 2016 Ron Howard’s Inferno. This is a sequence where Robert Langdon (Tom Hanks) and Sienna Brooks (Felicity Jones) are pursued by a villain in the attic of the Palazzo Vecchio. Brooks and Langdon will escape their ordeal, not the villain. For that shot I was tasked to animate some planks of wood and debris falling from the ceiling. The planks had to match the start frame of some polystyrene planks present during the stunt and their final posing would need to hookup with the bird’s eye view 24 seconds into the video. 1. 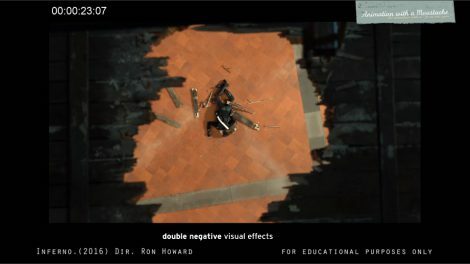 This wasn’t my first shot at Double Negative but that was my first shot in the Feature department. 2. I was the only animator with pretty much no lead or animation supervisor above me and responded directly to the VFX supervisor. 3. 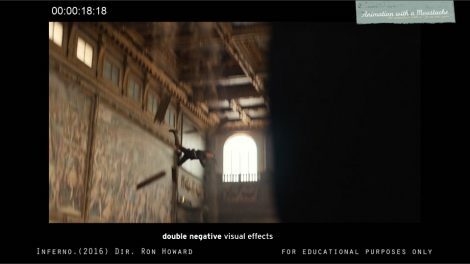 The stunt-woman originally only fell from 10 meters when the height of the ceiling and the speed of the camera pan went through several iterations. Being pretty technical (at least at that time), I quickly worked out that I should try to run several simulations with nDynamics in order to get some good references and possibly reuse the result for my final animation. This was a really good move as my CG supervisor only appeared after 3 days and I could see he was glad he caught me doing some R&D rather than checking cats videos on Youtube or checking the stock market. Interestingly enough the later is a cause for dismissal according to the contract but not the former. I eventually constrained and baked the planks and debris to the simulation, but this was only for starting the animation as eventually the camera motion got totally cheated and I had to hand key the whole thing frame by frame because of nasty gimbal locks and to better relate the speed of the planks to the speed of the live action . The final version wasn’t my favorite one as the planks lack some residual energy but it looked the less jarring as I had some really funky ones with some plank of wood doing some fun business on their landing. Something that really helped for troubleshooting the shot and discuss the workt was to have each plank numbered and colour coded. I hope you found this article interesting and let me know if you have any questions. Next are some drone shots from Inferno again.